At the beginning of July, TDG reviewed June performances for infielders, outfielders, and pitchers. 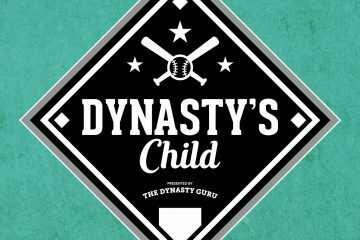 In addition, TDG updated the Top 500 Dynasty League Players, including 145 prospects. Since early July, several notable prospects exceeded rookie limits and others arrived in the majors. As this update only reviews performances for one month, please note this bright, flashing warning: SMALL SAMPLE SIZE! Ronald Acuña Jr., Atlanta Braves. Super prospect Acuña is living up to expectations. Thus far, he is making tons of hard (45.8%) and high quality (14.1%) contact, and hitting for power (226 ISO). On the downside, Acuña is striking out a lot (29.7%) and his plus speed is not translating to stolen bases (just 5). Ultimately, his outlook remains the same: above-average hit tool, plus to double-plus power, and above-average to plus speed. Juan Soto, Washington Nationals. What more can be said about Soto? 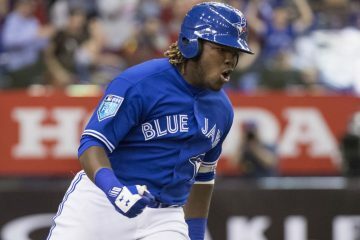 At just 19 years old, he is taking the majors by storm, hitting .313/.418/.567 with 13 home runs and a stellar 46-to-39 strikeout-to-walk ratio. Although he lacks the power/speed upside of Acuña, Soto has a potentially elite, 70-grade hit tool with plus power. Austin Meadows, Tampa Bay Rays. The Rays recently acquired Meadows as the centerpiece of the Chris Archer trade. Prior to the trade, he was having trouble breaking the Pirates crowded outfield. Now, Meadows is back in the majors. After an electric start to his career, he has struggled over the past two months. With an above-average hit tool, average power, and above-average speed, Meadows is a potential solid fantasy contributor. Tyler O’Neill, St. Louis Cardinals. Following the trade of Tommy Pham, O’Neill is back in the majors. Prior to the trade, he was, once more, on fire in Triple-A, with 7 home runs in 12 games (.341/.481/.927). The power is unreal! The closest major league comparison for O’Neill is Khris Davis. In fact, O’Neill could be better than Davis, with more speed, better defense, and a potentially better hit tool. Willie Calhoun, Texas Rangers. After a slow start, Calhoun heated up as the weather warmed. In July, he was nearly unstoppable in Triple-A, hitting .429/.520/.619 with just 2 strikeouts in 75 plate appearances. As such, Calhoun finally received the long-awaited promotion to the majors. Hopefully, he will award patient owners. Eloy Jimenez, Chicago White Sox. Few players are as hot as Jimenez right now. Over his past ten games, he has hit .514/.537/1.054 with 5 doubles and 5 home runs! With immense, 80-grade, light tower raw power and an above-average to plus hit tool, Jimenez is a future star. Since he is on the 40-man roster, his major league debut likely is imminent. Alex Kirilloff, Minnesota Twins. A player nearly as hot as Jimenez is Kirilloff. Since July 13th, he has gone 28-for-54 with 10 doubles, a triple, and 2 home runs. In the difficult Florida State League, Kirilloff is hitting .376/.401/.567 with 30.8% line drives. Grade Change: hit tool increases from 55 to 60. Corey Ray, Milwaukee Brewers. The Brewers selected Corey Ray fifth overall pick in the 2016 draft. For his first two years, he had nearly identically poor performances, including 156 strikeouts last year (31%). Although the strikeouts remain (28.6%), Ray doubled his power and speed output. This past month is a perfect microcosm of his season. In July, Ray hit 11 home runs, stole 13 bases, and struck out 41 times (.282/.344/.650). The power/speed potential is mouthwatering. Adam Haseley, Philadelphia Phillies. The sixth overall pick in the 2017 draft, Haseley earned a promotion to Double-A following a hot stretch in High-A. Thus far, he is enjoying the friendly-confines of Reading, hitting .400/.520/.650 at home. Ultimately, Haseley profiles as a solid, unspectacular player, with an above-average bat, borderline-average power, and above-average speed. Randy Arozarena and Adolis Garcia, St. Louis Cardinals. 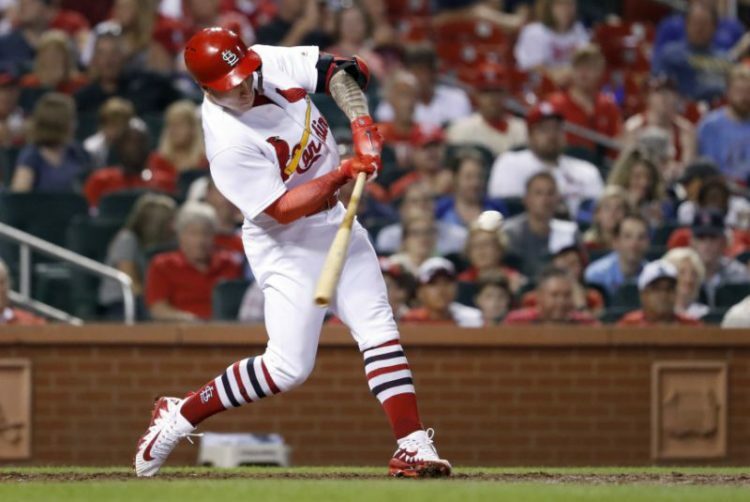 During the 2016-2017 international signing period, the Cardinals made two big signings out of Cuba, Arozarena ($1.25 million) and Garcia ($2.5 million). In fact, Garcia won the Serie Nacional MVP for the 2015-2016 season. Right now, both Arozarena and Garcia are on fire. Between Double- and Triple-A, Arozarena hit .320/.407/.600 with 5 home runs and 6 stolen bases. Meanwhile, Garcia has hit 7 home runs over his last 8 games, and 10 total in July. Fortunately for them both, the Cardinals just cleared some of the outfield logjam, trading Tommy Pham and Oscar Mercado. Kyle Isbel, Kansas City Royals. A third round pick this year, Isbel is an advanced college bat who hit .357/.441/.643 in his junior year. Thus far, he is making quick work of the lower minors. Between the Pioneer and South Atlantic Leagues this month, he has hit .376/.453/.602 with 14 stolen bases. Ramon Laureano, Oakland Athletics. In 2016, Laureano experienced a breakout season, hitting .319/.428/.528 with 15 home runs and 43 stolen bases. Returning to Double-A last year, he struggled all season (.227/.298/.367). This offseason, the Astros dealt Laureano to the Athletics as part of its 40-man roster crunch. This month, he is reminding everyone of his 2016 performance, slashing .373/.450/.673 with 8 home runs and 6 stolen bases. Taylor Trammell, Cincinnati Reds. During the Futures Game, Trammell hit a mammoth, 438-foot home run and earned the MVP award. The rest of his July did not go so well, as he hit just .206/.289/.314 with 36 strikeouts (34.6%). Monte Harrison, Miami Marlins. Another month, another 40+ strikeouts for Harrison. In July, he struck out 45 more times (34.1%), bringing his season total to 168 (37%). Like former teammate Ray, Harrison has a tantalizing combination of power and speed, but concerning swing-and-miss issues. Leody Taveras, Texas Rangers. With potentially above-average hit, raw power, speed, and defense, Taveras looks the part of an elite prospect. Unfortunately, his immense tools have not translated into performance. This past month, Taveras hit just .186/.262/.258. Victor Robles returned to action after a lengthy absence due to a hyperextended elbow. On July 30th, the Angels promoted 19-year-old Jo Adell to Double-A, and he hit a home run in his first game. On August 1st, the Astros optioned Kyle Tucker to Triple-A after he struggled over 16 games (.156/.240/.222). Luis Robert missed most of July after aggravating a left thumb injury. On July 31st, he began a rehab assignment. The Braves promoted Drew Waters to High-A and Cristian Pache to Double-A. The Orioles acquired Yusniel Diaz from the Dodgers as the center piece in the Manny Machado trade. Seuly Matias home run counter: 31. On his 20th birthday, Khalil Lee received a promotion to Double-A. The Mariners promoted Kyle Lewis to Double-A despite recent struggles. Tirso Ornelas is on the disabled list with a hand/wrist injury. The Padres finally promoted Buddy Reed to Double-A after he lit up High-A (.324/.371/.549 with 12 home runs and 33 stolen bases). Thus far, he has slowed at the plate (.155/.231/.190), but not on the bases (7 stolen bases). Season-ending injuries: George Valera (fractured hamate bone), Micker Adolfo (Tommy John surgery), and Braden Bishop (broken arm). Other notable trades: Oscar Mercado (STL to CLE), Conner Capel (CLE to STL), Gilberto Celestino (HOU to MIN), Forrest Wall (COL to TOR), Billy McKinney (NYY to TOR), Luke Raley (LAD to MIN), Gabriel Maciel (ARI to MIN), and Lorenzo Cedrola (BOS to CIN). On Monday, the Monthly Prospect Update will explore pitching prospects. Stay tuned! Soto lacks the speed potential of Acuna. He certainly does not lack the power potential! That much is very clear. In my opinion, he does. Of course, I note Soto has potential plus power, but Acuna has potential double-plus raw power and could get to most of it in games. Already, the power difference is evident, as Acuna creates louder contact than Soto. Although Soto is a stud, I would not confuse his power with Acuna’s monster power. I am no baseball scout, but just from watching Soto every game as a Nats fan….I’d say hhe doesn’t have the “potential” for plus power…..he HAS plus power. You mentioned Acuna makes louder contact…..so too does Soto! I think at this point some people are just being nit picky. I think both Acuna and Soto are going to be super-studs for years to come. But Soto’s power looks and sounds PLUS to me already.